Offering you a complete choice of products which include internal gear pump and external gear pump. Known as a renowned organization, we are involved in dealing an exquisite range ofInternal Gear Pumpto fulfill the needs of our customers. The Internal Gear Pump we offer has good chemical stability, which maintains flexibility over a wide temperature range. Additionally, this pump is easily used and ensures longer durability. TUSHACO Internal Gear Pumps series employs proven Internal Gearing (Gear within Gear) principle for pumping. The main gear is keyed to the drive shaft, and rotates concentric in the pump casing. Idler is located on an eccentric pin on the front cover to rotate freely and meshes with main gear when assembled. A crescent shaped partition precision machined on the front cover maintains a small, but positive clearance to achieve perfect scaling between parts. As the gears come out of mesh, a partial vacuum is created, forcing the fluid to rush into the pump casing and fill in the voids between the teeth. Both Gear Pumps rotating in the same direction of rotation gently transfer the fluid to the delivery port. The resulting action is a smooth-steady flow; low in pulsation, noise and vibration. 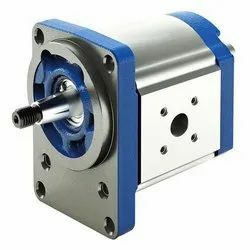 Internal Gear Pumps have Single shaft design well supported on outboard bearing (except for one inside sleeve bearing) enables to pump products even with poor lubricating value unlike in the external Gear Pumps. External bearing construction offers easy access the pump components i.e., rotor set and even pump casing simply by removing the front cover without disturbing drive parts, bearings etc., and in place. Block pump mounted integrally on hollow shaft gearbox automatically reduces the speed (in several ratios) and enables even the pump rotor to be pulled out without disturbing the drive! It is easily possible to jacket front and rear covers for products heating - thus making the design unique and versatile - ideally suited for process pumping. The Internal Gear Pumps series is modular developed with excellent interchangeability. The Internal Gear Pumps is available either as bracket mounted 'BM' or gearbox mounted 'GM" models. The bracket mounted casing construction provides stress free operation while handling products at higher temperatures. The major components are casing, front cover, rear cover, seal box (casing parts) and rotor set (rotor, idler and shaft). Most casing components are made by lost wax process for better finish and grain structure. 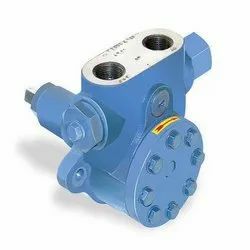 Owing to our sound experience, we have been successful in catering to the requirements of our esteemed clients by offering quality range ofExternal Gear Pump. The External Gear Pump we offer consists of excellent strength for the easy work and low work pressure for the user. Made up of best grade material our range is corrosion resistant. External Gear Pumps have only two rotating parts matting externally having principle of gear within gear. Single gland construction reduces leakage to minimum. External Gear Pumps are well supported with the help of 4 bearings. Power consumption is less than conventional pumps. Looking for Gear Pump ?